When we tried to get ready to sail Nameless – even though that door still is not installed – we found that her rudder wouldn’t turn easily. No surprise. 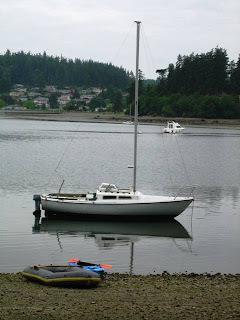 For ten months now she’s been sitting unsailed, uncleaned, unloved in Puget Sound, where marine organisms are not shy about attaching themselves to hulls. So this weekend we careened her in order to scrape the mussels and barnacles off her bottom. Never having done this before, we didn’t plan as well as we might. Sunday morning at 9:30 I suddenly decided the time had come even though the tide was already half way out and low was at noon. 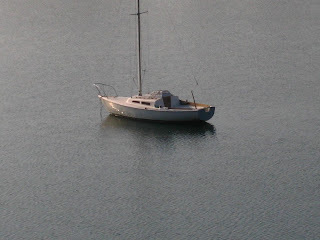 I’ve desperately wanted to sail and we couldn’t move her without first freeing that rudder. The tide was low at about noon so we were pretty late bringing her to shore and hence she was never completely out of the water. The little derelict awaits the tide. We were only able to scrape off half the load but at least the rudder can move. This was a growth experience. Once she was floating again we cleaned her topsides for real. I had been on the verge of naming her Grime-elda or Guanita, but now she gleams in the sun like a starlet who’s had her teeth whitened. Back ashore it occurred to me – a little belatedly – to check whether beaching a boat to clean the bottom is legal. For one thing, there was eelgrass where we were working. We tried to walk around it but I’m sure we stomped some. Oh, the guilt. For another, barnacles stick pretty tight to bottom paint and some of them took little bits of blue with them when they went. Even more guilt. 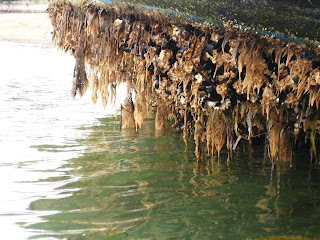 Bottom paint is one of the necessary evils of boats, but it can be pretty toxic stuff. Jer used one of the less polluting types, but still, this is not something I want to do more than once. The question of whether we spent a couple of hours in Bonnie and Clyde mode is still unanswered. I wasn’t able to find anything definitive in my quick search, but what I did find made me think we won’t be doing this again. So, this is one waterfront living endeavor that wasn’t particularly responsible. In other words, don’t try this at home. To get Nameless any cleaner she’s going to need to be hauled. In fact she’ll need to be sanded down and repainted again sometime soon. But I swear, that will not happen before she takes us, at least once, on a six mile joy ride to the end of the harbor!